Dragonz online slot with free spins! Try out Casino La Vida’s exciting new slot game, Dragonz, brought to you by leading game software Microgaming. Dragonz is a 5×3 Reel, 3D video slot and has multiple ways to win. With the captivating visuals and the exciting quirky characters, this game will add some colour and laughter into your life. Play with the mystical and legendary creatures named Flint, Switch, Frost and Gobble, and you will soon become attached and adopt one of them as your favourite dragon. While experiencing the myth of the mysterious dragons, you’ll also stand a chance to win big. Are you a fan of Wild symbols throughout your slot games? Well, you will definitely enjoy Dragonz. This slot game particularly focuses on maximising of Wilds throughout. Dragonz introduces a new Wild Deal™ feature in the base game whereby a non-winning Wild landing on Reel 3 will randomly distribute extra Wilds onto the reels to award a guaranteed win! Land 3 or more scatters anywhere on the reels and you’ll trigger Free Spins, with one of 4 Free Spins features randomly awarded. Each Free Spins feature will award you 10 Free Spins! There are 243 Ways to win that available from left to right, and you could win up to 2,150 000 coins! Your ways to win will be multiplied by your coins bet and only the highest winning counts. Your scatter symbols will be multiplied by the total bet wagered, scatters will add to Ways to wins and scatter symbols will pay in any position. 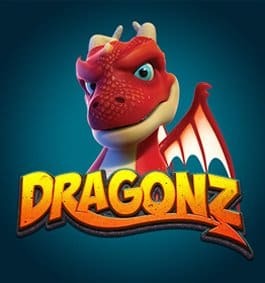 Play Dragonz and enjoy your share of phenomenal game features. Brighten up your gaming experience with the 4 playful dragons, join Flint playing with fire, freeze your way through it with Frost, brighten up the game with Switch or just goof around with Gobble. To sum up, in our opinion Dragonz slot deserves 4/5 in our rating.